In the scorching summer of 1878, with the Gilded Age in its infancy, three tenacious and brilliant scientists raced to Wyoming and Colorado to observe a rare total solar eclipse. One sought to discover a new planet. Another-an adventuresome female astronomer-fought to prove that science was not anathema to femininity. And a young, megalomaniacal inventor, with the tabloid press fast on his heels, sought to test his scientific bona fides and light the world through his revelations. 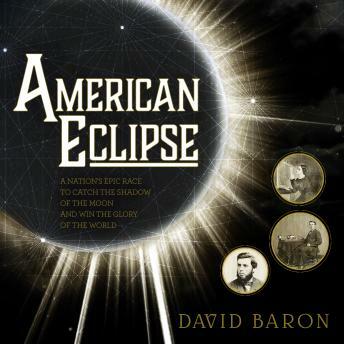 David Baron brings to three-dimensional life these three competitors-James Craig Watson, Maria Mitchell, and Thomas Edison-and thrillingly re-creates the fierce jockeying of nineteenth-century American astronomy. With spellbinding accounts of train robberies and Indian skirmishes, the mythologized age of the last days of the Wild West comes alive as never before. A magnificent portrayal of America's dawn as a scientific superpower, American Eclipse depicts a young nation that looked to the skies to reveal its towering ambition and expose its latent genius.